"I have omitted all those things which I have not myself seen, or have not read or heard of from persons upon whom I can rely. That which I have neither seen, nor carefully considered after reading or hearing of, I have not written about. With Exceptions." 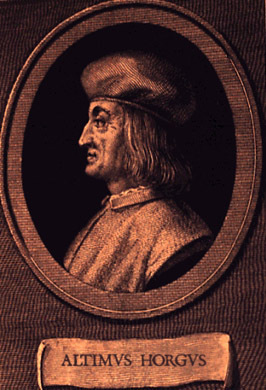 Altimizia Horg, better known by the Latin version of his name Altimus, was born in Florence, Italy in 1601. Young Altimus was the eldest (by his reckoning) son of a wealthy cicolatto importer. He studied the classics from an early age, and at age 15 determined to dedicate his life to the pursuit and dissemination of knowledge. His studies at Verona University were lackluster, but he came away with a smattering of latin, greek, mathematics, geology, nosography, archeology, natural sciences, bookbinding, theology, craniology, physics, improv, the fine arts, and trivia. This last endeavor was to help him find his fortune, as he, after winning a last round of 20 questions,with his cohorts at a local pub in August of 1620, hastily wrote what would be 17th Century Italy's most popular board game, "Inseguimento di Insignificante". It became an instant hit among the Papal Court which renamed it "Trivium Pursuitum". With its special attention to the many physical curiosities and nonessential details that were being brought to Rome from the New World, it allowed many a cardinal to prove his mettle to others of the Vatican. And with that, Altimus Horg was now a wealthy man, and proceeded to follow his dream. Rather than being known for his extensive work in a single discipline, Altimus instead spent his amassed wealth creating an impressive array of scientific foundations, trusts, and committees.. Often these foundations were created in the absence of any actual scientific discipline for them to fund, or lacked any context to contemporary disciplines at all. Among the societies founded by Altimus, the less popularized are: the Half-Orbed Retraction Gallery, (est. 1651), the Homeopathic Optical Refraction Governance (est. 1640), The Hobbyists Ousting Rutabega Garnish (est. 1639) Horticulturally Occupied Renouncers of Galileo (est. 1652), and the Helium Observers for Reversing Gravity (est. 1654), most notable for the fact that Helium itself was not discovered on earth until 1895. When confronted, as he often was, as to the staffing and purpose of these societies, Altimus was evasive and elusive, preferring to work in his study, pursuing his studies, and writing treatises in books that were published at the Historic Official Records Gallery. 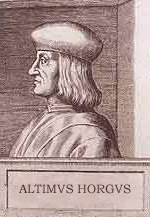 Despite the wealth afforded to him from "Inseguimento di Insignificante", Altimus' real passion was for academia, and through his publications he sought to become, in his words, "A nexus of important and timely research." His publications found their way into the libraries of dukes and nobles throughout Europe, though it must be mentioned that there exist no records any purchases by these libraries. Indeed, there is a famous account of the Vicomte d'Torresano, while hosting a soiree at his castle, spying Altimus sneaking into the Vicomte's own library, a stack of books in hand. Regardless of his credentials among the academia, Altimus' contributions to the many fields he endeavored in cannot be ignored. The most notable of all is his treatise on the Occlupanids, which were a principal obsession of his since his boyhood days in Florence. Altimus is credited with the first description of occlupanids as a species, the first description of occlupanids in a text, in fact the first mention of occlupanids at all in western literature. He is also the first to devise a system of classification of the occlupanids he found, which though impressive, was far from complete at the time of his death in1679. Though the estate left to Altimus adjacent to the Ponte Vecchio had been annexed by jewel merchants long since, the wealth of information that Altimus Horg left to the world has endured. Collections in Genoa, Reykjavik, and Berkeley can be viewed by the public. Private collections of his published works can be found in Santa Cruz California, and the Howland Occupied Reef Garrison. No visit to Florence is complete without a stop at the gravesite near the Boboli Gardens, where the researcher's tomb is located. Fresh radishes are placed by the city every third friday in April, attendance is free.